Sadler’s principle client, Hornis Racing, purchased the son of Twirling Candy, who’s pointing to the Grade 2, $300,000 San Antonio Stakes for new connections on Dec. 26 — opening day at Santa Anita Park. Former conditioned by Chad Brown and owned by William Farish, Gift Box is 3-5-2 in 13 career starts. Since the 2016 Discovery Stakes (G3) he has competed exclusively in allowance optional claiming races in New York, never outside the exacta in his last five outings. 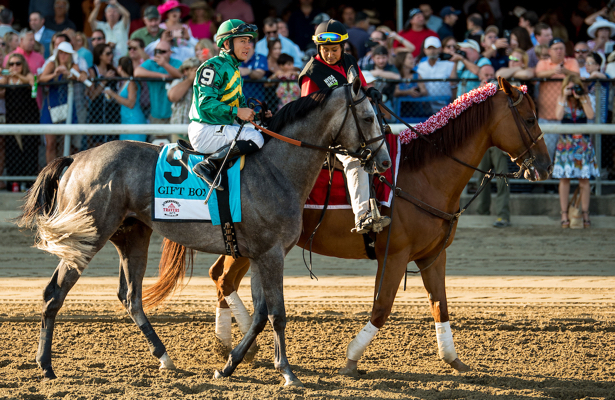 Sadler said connections were resting Gift Box, who last raced on March 24, at a farm after he incurred an injury. Gift Box most recently worked six furlongs Tuesday in 1:14.40, ranking second-fastest of six horses at the distance. Hronis Racing, of course, campaigns soon-to-be champion Accelerate along with another Sadler trainee who’s expected to supplant him as the barn’s big horse, Catalina Cruiser. The 4-year-old by Union Rags went into the Breeders’ Cup Dirt Mile unbeaten but never found his footing as a big favorite, finishing sixth. In terms of the next generation of Sadler runners, he said “the one to watch” for is Nolo Contesto, a $385,000 Hronis Racing purchase who finished fifth on debut over the weekend at Del Mar. The colt was disadvantaged by the inside post but closed despite jockey Joel Rosario losing a stirrup. Sadler expects Nolo Contesto, by Pioneerof the Nile, to run again Jan. 2 at Santa Anita Park going a mile in maiden special weight company.